New Zealand Heartland’s winger Nathan Hunt who scored a brace of tries in his team’s 64-6 thrashing of the Cooks. The visiting New Zealand Heartland XV gave the local selection side a lesson in New Zealand-style rugby on a wet BCI Stadium ground on Tuesday evening where they dealt out a 64-6 thumping against the local lads. 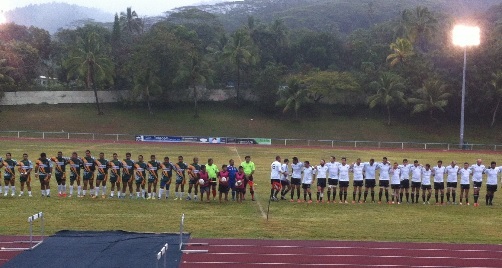 The Cook Islands selection actually led 6-3 after 10 minutes, with the Cooks halfback Tiano Arona kicking two penalties. This only spurred the New Zealand Heartland lads on as they went on to score nine unanswered tries with six of the nine tries being scored by their wingers Nathan Hunt and Sam Monaghan along with fullback Mike Tambour. The physically bigger New Zealand Heartland forward pack dominated set piece and the collision-area which set a good foundation for their backline to run in some impressive team tries. The visitors lead at the halftime break 31-6. The next match for the two teams is this Friday at 4.30pm at the BCI Stadium in Nikao. Can the Cook Island selection team make improvements from the Tuesday match? Be at the BCI Stadium on Friday at 4.30pm to support your team and find out. At 3.30pm a curtain raiser rugby 7’s match between the under 13 Town and Country teams will kick-off proceedings. The Heartland XV started their Cook Islands tour with an emphatic 64 – 6 win over the Cook Island Residents XV. A tropical down pour just before the game, the first rain in Rarotonga for three months, made the conditions slippery but bearable for the tourists and didn’t dampen their open style of play. The size and commitment of the Cook Islanders kept them in the game for the first 15 minutes and they got out to a 6 – 3 lead after penalties were traded. But the Heartland team played some good percentage rugby and managed to rumble lock Craig Moore, who was damaging all day, over for the first try. Then as the weather had done an hour before the flood gates opened and the Heartland scored four tries in quick succession. Sam Monaghan who was impressive in his first outing on the wing scored two, as did the opposite wing and Wairarapa team mate Nathan Hunt. The second of Hunts tries a brilliant set move off a mid-field scrum which demolished the home side for most of the match. The only thing to slow the visitors at that stage was the sending off of lock Andrew Smith for contact of a players head with his boot and they went into half time 36 – 6 ahead. In the second half Ethine Reeves got the scoring underway with a bustling try close to the line. Then the other outside back, full-back Michael Tambour got in on the act and scored a pair for himself. His second coming from a searing mid-field break by Peni Nabainivalu as he has done so for Buller all season. Jake Ashby came on late in the game and got reward for his energetic showing with a try right on full time. James Lash who had kicked very well all game landed the conversion to take the final score to 64 – 6. The Heartland XV will be happy with the way they stuck to their task, with the home team showing little in the way of technical skills or game structure. The next game between the two teams is Saturday 3:30pm (NZT).